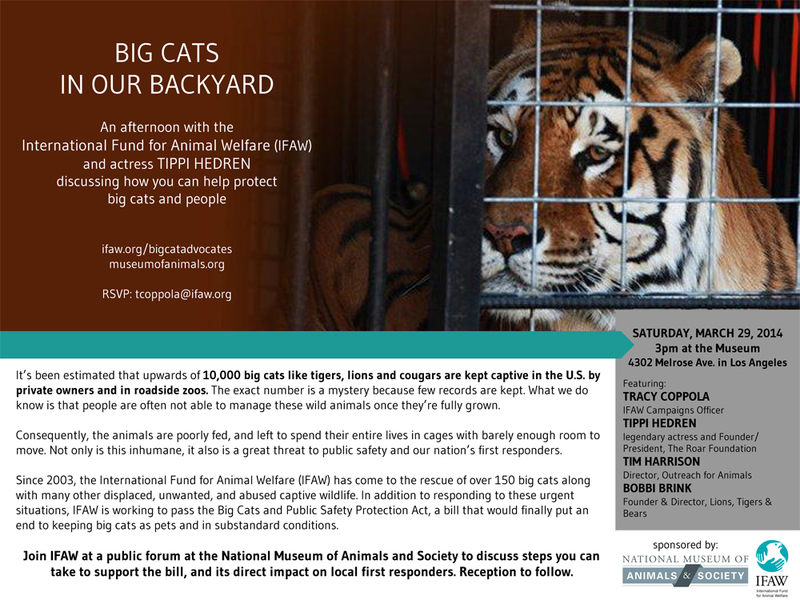 Please attend this important event put on by IFAW to discuss big cats born in the United States to be sold as pets or for financial gain and "Big Cats and Public Safety Protection Act" (H.R. 1998 and S.1381). Your support is needed to get this Bill passed to stop the insanity. This is important!!! Reservations are going very quickly. I look forward to seeing you there. Washington, DC, January 21, 2014 -- Born Free USA, a leader in animal welfare and wildlife conservation, applauds West Virginia state senator Bob Beach (D- Monongalia) for introducing S.B. 371 -- “Prohibiting Possession of Wild and Exotic Animals.” The bill seeks to improve animal welfare and protect the public from potentially dangerous exotic animals by enacting stricter regulations on exotic animal ownership. West Virginia is one of only eight states that lack any substantive restrictions for wild and exotic animals kept by private individuals, and Senator Beach’s bill would fix this glaring and dangerous legal oversight. S.B. 371 would ban the private possession of all “wild and exotic animals” in West Virginia, which are defined as any animals other than domestics and livestock. Exotic animals owned prior to the enactment of this bill can be kept, as long as the owner obtains a permit. The bill is narrowly crafted to ensure that only private owners are affected. This bill does not apply to accredited exhibitors, nonprofits, animal control agencies, wildlife rehabilitators, veterinary clinics, sanctuaries, researchers, or educational institutions. These safeguards are crucial not only for animal welfare, but also for the protection of communities. Born Free USA maintains a database that tracks incidents involving exotic pets (www.bornfreeusa.org/database). Since 2000, there have been at least seven reported incidents in West Virginia of exotic pets escaping and threatening public safety. In Huntington, a 13-year-old girl suffered injuries after being bitten by a “pet” capuchin monkey. In Berkeley County, another monkey who was suspected of having hepatitis B bit three children. Wild and exotic animals can not only injure people, but also pose a disease risk. Primates alone can transmit Ebola, tuberculosis, and herpes-B to humans. Born Free USA is a nationally recognized leader in animal welfare and wildlife conservation. Through litigation, legislation, and public education, Born Free USA leads vital campaigns against animals in entertainment, exotic “pets,” trapping and fur, and the destructive international wildlife trade. Born Free USA brings to America the message of “compassionate conservation” -- the vision of the U.K.-based Born Free Foundation, established in 1984 by Bill Travers and Virginia McKenna, stars of the iconic film Born Free, along with their son Will Travers, now CEO of both organizations. Born Free’s mission is to end suffering of wild animals in captivity, conserve threatened and endangered species, and encourage compassionate conservation globally. More at www.bornfreeusa.org, at Twitter www.twitter.com/bornfreeusa, and on Facebook facebook.com/bornfreeusa. (Washington, DC – April 1, 2013) – This past Friday, the Detroit Tigers organization posted photos on its Facebook page of its star players handling a tiger cub at a spring training camp. “Undoubtedly, the Detroit Tigers, like so many other animal enthusiasts in the U.S., did not realize the photo op presented some fairly significant public safety and animal welfare issues. Handling a wild big cat is not a game and treating them like a ‘pet’ poses extreme risks. In the past two decades, U.S. incidents involving captive big cats—tigers, lions, cougars, leopards, jaguars, cheetahs and other species—have resulted in the deaths of 22 humans and nearly 300 human injuries. Additionally, dozens of U.S. traveling zoos and roadside exhibitors—like the Dade City's Wild Things Zoo, which was responsible for providing the cub for the photo op—profit from charging the public a fee to pet and pose with tiger cubs and other large big cats. After the cubs grow too big and dangerous for handling, all too often they could be kept in someone's backyard; bred incessantly to further fuel the cub handling trade, or even be killed. This is why passing the Big Cats and Public Safety Protection Act—a nationwide ban on private big cat ownership and breeding that will soon be reintroduced in Congress—is so important. Jarod Miller is a young naturalist, zoologist, television host and producer, with 20 years of experience working with animals, and 15 years of experience in television. Miller has spoken at venues ranging from wildlife parks and universities, all the way to the White House. He is also the former executive director of the Binghamton Zoo, and was the youngest accredited zoo director in the United States at age 25. Since he was 10, Miller has both propagated and worked to conserve endangered animal species. He has raised, studied and handled a tremendous variety of wildlife including large cats, bears, prosimians, large and small primates, birds of prey, crocodiles, venomous snakes and reptiles, and large hoofed animals, among many others. He is also experienced in the research and data collection of captive and wild specimens. As a teenager he also trained champion dogs for obedience competitions and national showmanship. As a child Miller spent most of his time outdoors, always wanting to be closer to nature. Zoos were always his favorite destination, and he could identify every animal that lived at the zoo. In fact, when asked to write down his favorite animal for a second grade assignment, he came up with a three-page list of nearly 200 species. Miller earned a degree in Zoology from Oswego State University in New York, and has published and presented research on primate behavior and ecology within the scientific community. He is a professional fellow of the American Zoo Association, an associate member of Sigma Xi Scientific Research Society, and a member of the American Federation of Television and Radio Artists. In 1996, Miller started his own wildlife production and education company, Wild Encounters, and has since traveled to over 13 countries, focusing on areas in South America, Central America and Equatorial Africa. In the past decade, Miller has made hundreds of appearances on national television, as a regular guest on such shows as, The Today Show, Good Morning America, The Early Show, The Tonight Show with Jay Leno, Late Night with Conan O’Brien, Jimmy Kimmel Live, The Late Late Show with Craig Ferguson, Rachael Ray, Live with Regis and Kelly, Entertainment Tonight, Access Hollywood, among many others, and is a regular contributor for NBC News, CNN, and Fox News. We are at a world-changing time in the history of wild animals in captivity and in the wild!! !......WE NEED YOUR HELP IN ORDER FOR TWO ISSUES TO COME TO FRUITION!!!! First..... the Federal Bill I brought to my U.S. Rep. Buck McKeon to stop the insanity of breeding Exotic Felines such as, Lion, Tiger, Leopard and Jaguar in the U.S. to be sold as pets or for financial gain will be before Congress again within the next few weeks. The title, "Big Cats and Public Safety Protection Act", formerly H..R.# 4122, and S. # 3547, will be given new numbers during the coming session. Please stay on top of this urgently needed bill thru www.shambala.org and write to your Congressional Representatives and Senators. Second....The .U.S. Dept. of Fish and Wildlife is considering and is urgently requesting studied opinions on adding The African Lion to the Endangered Species List. Considering the rapid diminishing numbers of this species due to encroaching civilization, trophy hunting and poaching, (same issues I've talked about for years), it is indeed time we take advantage of this opportunity to let our Government know the severity of this huge problem and encourage them to put the African Lion on the endangered list as stipulated in the Endangered Species Act of 1973, as soon as possible. Again, we are at a very important time in the History of Greats Cats on our planet. We have until 11: 59 P.M. January 28, 2013 to have your opinion registered!!! After that, your statement may not be registered or given credence!!!!!! Please, contact friends, family, celebrities to help this monumental problem come to a close!!!!! Below, you will find information on why it is so urgent to be a part of this movement!!! !....included are important, and not well publicized issues, that will help you with your statements. Your voice is important!!!! !......It counts!!! !......Use it!!!! !.....Please, and thank you for caring, and acting on those feelings. With love for The Wild Ones Everywhere!!!!! Washington, D.C. (May 4, 2012) - - Born Free USA, a leader in animal welfare and wildlife conservation, is working with the New York State legislature to pass a bill to protect the public from potentially dangerous exotic animals by enacting stricter regulations on exotic animal ownership. Introduced this week by Assemblymember Linda B. Rosenthal (D/WF-Manhattan) and Senate Environmental Conservation Chairman Mark Grisanti (R-Buffalo), A10041/S7078 requires exotic animal owners to pay for damages or expenses incurred when their animals escape or are intentionally released. The bill also requires owners to immediately report animal escapes to local police and animal control. New York State currently bans private possession of exotic animals, with an exemption for people who had possession prior to January 1, 2005. However, the law does not provide a deterrent for intentional or negligent release of these animals, nor does it provide a means of support for local law enforcement when responding to these actions. “Although these animals may be beloved pets, they are first and foremost wild animals, and owners of exotic animals must be held accountable when these animals escape or are negligently released. I look forward to continuing to work with Born Free USA on this important issue, and I call on the Assembly and Senate to approve this legislation,” explained Assemblymember Linda B. Rosenthal. Both bills now head to their respective committees on Environmental Conservation. Born Free USA tracks numerous reports of dangerous exotic “pets” who are intentionally released or escape. In New York, a six-and-a-half foot long boa constrictor was recently found by a homeowner doing work under his home in Enfield; a Putnam Lake woman died after apparently being bitten by her loose “pet” black mamba; and two separate attacks by loose “pet” capuchin monkeys occurred in less than four months—first at a Catskill bed-and-breakfast and then in Oneida Castle. Through litigation, legislation, and public education, Born Free USA leads vital campaigns against animals in entertainment, exotic “pets,” trapping and fur, and the destructive international wildlife trade. Born Free USA brings to America the message of “compassionate conservation” -- the vision of the U.K.-based Born Free Foundation, established in 1984 by Bill Travers and Virginia McKenna, stars of the iconic film Born Free, along with their son Will Travers, now CEO of both organizations. Born Free’s mission is to end suffering of wild animals in captivity, conserve threatened and endangered species, and encourage compassionate conservation globally. More at: www.bornfreeusa.org; twitter http://twitter.com/bornfreeusa; Facebook http://www.facebook.com/BornFreeUSA. (SCHAUMBURG, Ill.) November 2, 2011—The American Veterinary Medical Association (AVMA) has called on governors in seven states with lax laws to adopt stricter regulations restricting the private ownership of wild animals that pose a significant risk to animal and public health. On Oct. 18, the owner of an unregulated wildlife reserve in Ohio freed dozens of wild animals before killing himself. Forty-eight animals were killed by the sheriff’s department. Idaho, Alabama, North and South Carolina, Nevada, West Virginia, and Wisconsin have been identified as having lax regulations on the ownership of wild animals. Governors in all seven states received a letter from the AVMA urging stricter control and offering expert assistance from the AVMA in crafting effective regulations. Since 2006, the AVMA has urged lawmakers to limit or prohibit private ownership of wild animals that pose a significant risk to public health, domestic animal health, or the ecosystem (including the health of indigenous wild species), as well private ownership of wild species whose welfare is unacceptably compromised by being kept under such conditions. The AVMA’s policy on private ownership of wild animals can be found at http://www.avma.org/issues/policy/wild_animal_ownership.asp. To view the letters click here: http://www.avma.org/issues/animal_welfare/OwnershipWildAnimals.asp. For more information, please visit www.avma.org.